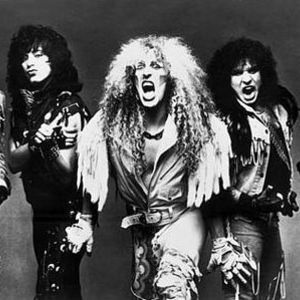 Twisted Sister is an American heavy metal band from Long Island popularized in comedic music videos on the television channel MTV in the 1980s. Although formed as a Bowie-inspired rock band by guitar player Jay Jay French in 1973, the band's style shifted to a more heavy metal-influenced sound when Dee Snider joined the band and took over songwriting. They fused the shock tactics of Alice Cooper and W.A.S.P. They fused the shock tactics of Alice Cooper and W.A.S.P., the rebellious mood of the New Wave of British Heavy Metal, the style of early Judas Priest, and the extravagant makeup of Kiss. Often misconceived as glam - the makeup and Dee's especially was more transformed into a horror creation, and the music is a lot more hard hitting, with rebellious or angry or violent or rock n roll or pride lyrics than love or happy lyrics. However, the band's fifth album, Love Is For Suckers - originally intended by Dee Snider to be a solo record - was plain heavy metal but drew heavy influence from 80's glam metal. To this day, members of the band do not feel Love Is For Suckers to be a Twisted Sister album. The group's hit songs include "We're Not Gonna Take It" and "I Wanna Rock" - each from the band's third album Stay Hungry. Many of the band's hits theme around parent vs. child conflicts and criticisms against educational system. The group had a shock rock-like image and have been mislabelled as glam metal but musically they were closer to classic heavy metal bands such as Judas Priest and Mot&ouml;rhead than the other glam metal/pop metal bands of the era, for example Quiet Riot, Poison and Ratt.